Fitting Fitting generally represents the Base Curve and Diameter of the lens in mm.Typical values range from 8.00 to 10.00 for Base curve�and 13.00 to 14.5 for Diameter Power Often called 'sphere' or 'strength. Measured in diopters and always preceded by - (minus) or + (plus). Negative (-) powers are prescribed to help correct short sighted conditions. Positive (+) powers help to correct a long sighted condition Cylinder A Cylinder value on your prescription is normally used when you have Astigmastism, a condition where the eye is not spherical thus light reflacts into the eye in a different way. Cylinder can be preceded by either - (minus) to correct short-sighted astigmatism or + (plus) to correct long-sighted astigmatism Axis Prescriptions with a "Cylinder" figure will also have an "Axis" measurement. Axis indicates in degrees exactly where on the eye the astigmatism is located. It is usually a figure between 0 and 180� and reflects the orientation needed in the Cylinder of the lens to correct your astigmatism. The pioneer of toric lenses, Ciba Vision brings Focus Dailies Toric 90 pack lenses for those suffering with astigmatism. 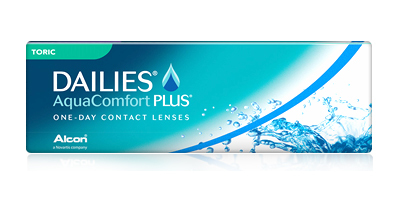 These lenses come with a guarantee of clear vision and unbeatable comfort. 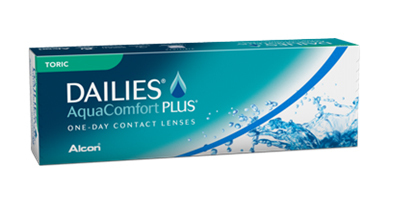 Experience the excellent comfort, brilliant visual acuity, fresh feel, hygienic eyes and safe vision with the Focus Dailies Toric 90 pack contact lenses. There is no messy cleaning, annoying maintenance or careful storage with these disposable toric lenses. 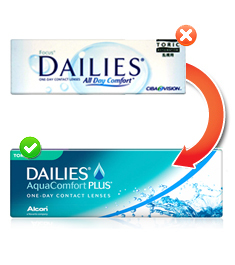 Focus Dailies Toric 90 pack contact lenses are one of the most popular disposable lenses in the market for treating astigmatism. Every morning just insert a fresh pair, which you wear throughout the day, without worrying about discomfort or irritation. You will experience consistent clear vision and sufficient hydration. 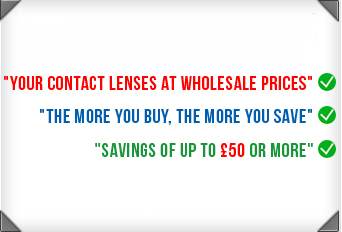 Buy affordable Focus Dailies Toric 90 pack lenses from us, sourced directly from the manufacturer.